The NEW Daily Decision for 9.10.18 - What If Something Bad Actually Happens? | Marketfy or install Google Chrome Frame to experience this site. The NEW Daily Decision for 9.10.18 - What If Something Bad Actually Happens? In case you have somehow missed it, the ten-year anniversary of Lehman's collapse is upon us. The fall of Lehman Brothers, and perhaps more importantly, the fact that Wall Street didn't bail out the firm, is widely viewed as the trigger for the ensuing credit crisis and the "Great Recession." Given that the economy has recovered and now appears to be humming along, and the fact that the S&P 500 has gained 337% since the crisis ended, there is no shortage of folks looking intently for the next big problem. To be sure, most folks never see a bubble or crisis coming. Heck, very few investors even understood what was happening during the credit crisis. Thus, I find it mildly reassuring that so many are in search of the next debacle. But since everyone and their brother is looking for things to worry about, I thought it might be a good idea to run down the growing list of issues traders are fretting over this morning - just in case something bad were to actually happen or you were feeling overly upbeat about the outlook for the markets and/or your portfolio! The following list of worries is offered in no particular order of importance and represents about 5 minutes of scribbling while waiting for Sunday's football games to begin. The Shift to Passive: JPMorgan's Marko Kolanovic opined last week that the $3 trillion shift from active and/or value to passive and momentum will be a problem. The trader dubbed "half man/half God" by CNBC, suggests that the lack of assets now available to active/value managers will mean less liquidity during the next market crisis, which, will, in turn, exacerbate the problem. Marko figures this situation will be a contributing factor to the next big bear, which could see the stock market to fall more than 40%. Quants Rule: Along the same lines, it is important to understand that algos control a great deal of today's trading. It has been awhile since there were humans standing ready to buy or sell a round lot of the shares they made markets in. No, today's trading is controlled by machines, which pull liquidity the minute (oops, I mean, nanosecond) things start to look dicey. The key here is that Flash Crashes and the type of volatility event seen in February are likely to continue if/when something bad actually happens. European Bond Yields: If there is one thing that keeps me up at night it is the fact that European bond yields trade well below their U.S. counterparts and in many cases, the yields are still negative. The question of course, is how does this end? Economic Slowdowns: Don't look now fans but the economies of Europe and China (among others) are slowing. This obviously puts a big dent in the global growth story. Emerging Markets: Here we go again - another emerging markets crisis appears to be upon us. Blame it on politics, inflation, global demand, or trade. But the emerging markets are now verging on bear market territory, which is to say nothing of the debt/currency troubles brewing in many markets. Global Markets: It is said that the best bull markets are global in scope. So, if you don't make a review of the global stock market charts a part of your weekly routine, take a look a weekly chart of Europe, Japan, China, India, the Pacific Rim, Latin America, etc. Can you say, ouch? Japan's QE: If you want to be astonished, dig into what the Bank of Japan has been doing. Insert head shaking emoji here. Trade Wars: The "Art of the Deal" appears to be playing out in front of us on many fronts. I for one, sure hope these trade wars are indeed "easy to win." Because if they become prolonged, there are likely to be unforeseen consequences. Political Risk: Leaving my personal view of what is happening in Washington out of it, there can be no argument that political risk is part of the game these days. The Mid-Terms: A subcomponent of the Political Risk category is the uncertainty surrounding the Mid-Term elections. The problem here is that even if you can predict the outcome, you aren't likely to correctly predict what the market will or won't do. Inflation: Friday's Jobs report showed that wages are starting to rise in a meaningful way. And while the Fed really can't do much on this front, a big worry is that wage inflation will become entrenched in the economy. Insert negative macro extrapolations here. Seasonality: September is said to be the cruelest month for the stock market. And history shows that October can be a problem at times. Fingers crossed that we can get to November without much ado. Debt: Another big-picture worry to put alongside negative yields in Europe, Japan's QE, and the potential resurgence of inflation is the monstrosity of debt that has built up in the global financial system. It is probably best to not think too long or hard about the subject as one has to wonder how this gets resolved. Valuation: By now, my guess is that just about everybody in the game knows that stocks are overvalued from a long-term and/or traditional metric perspective. And if one looks at how the market tends to perform in the ensuing years after the market becomes overvalued, they will find it isn't pretty. Peak Earnings: Given the corporate tax cuts and the ginormous benefits to companies, many worry that the current gains in earnings are unsustainable. Perhaps my biggest concern about the stock market has to do with the combination of the shift to passive and the quants running the markets. For me, the bottom line becomes the title of this week's missive... What if something bad actually happens? My apologies for what will likely be viewed as a discouraging, "Negative Nancy" start to the week. And since I'm a card-carrying member of the glass-is-at-least-half-full club, it pains me to run through the laundry list of things to fret about. Yet at the same time, I think it is important to be aware of the potential problems so that one might be able to understand what the heck is going on if one of these issues becomes the focal point of the market. Finally, let me "talk my book" for a moment. Given the current age of the bull market and the "wall of worry" that stocks continue to climb, I think it makes a lot of sense to have a risk management plan for at least a portion of one's portfolio. If/when something bad does actually happen, I like the idea of having strategies in place that provide at least a fighting chance to reduce exposure to risk the next time the bears come to call. 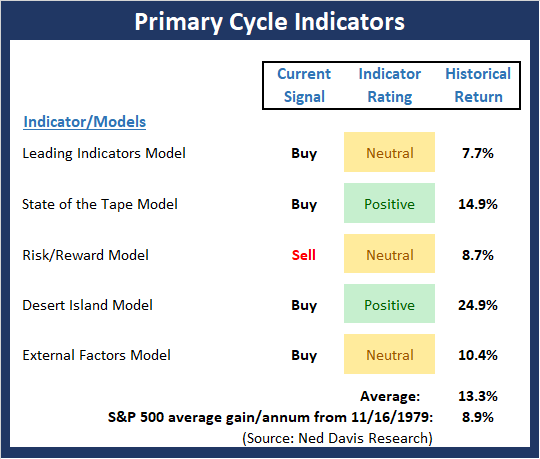 Despite the market moving lower on a daily basis lately, my Primary Cycle board saw some improvement last week. However, you may want to hold the champagne for now as the increases in the model readings of the Risk/Reward and Desert Island models were literally the smallest amount possible to cause the upgrades. But for now, the board looks and "feels" a bit better. 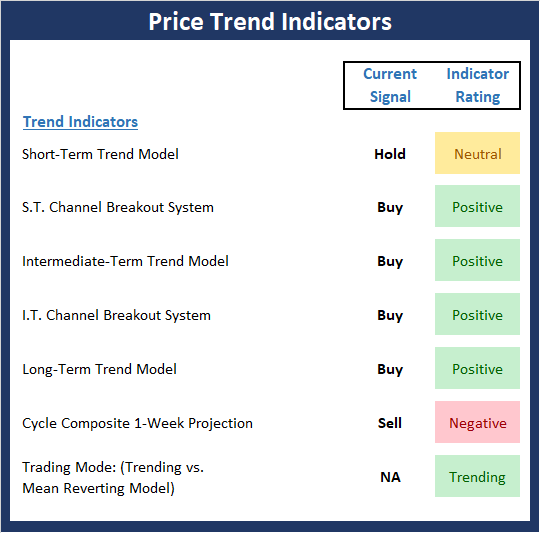 Not surprisingly, there was some deterioration in the Trend Board readings last week. However, despite the string of daily declines, the board remains in pretty decent shape. 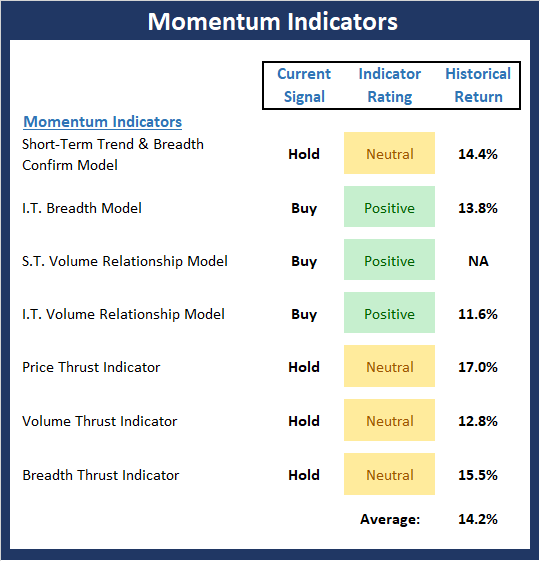 The Momentum board also saw some slippage this week as the shorter-term thrust indicators pulled back into the neutral zone. But overall, the board is still in good shape and sports a historical return well above the mean. 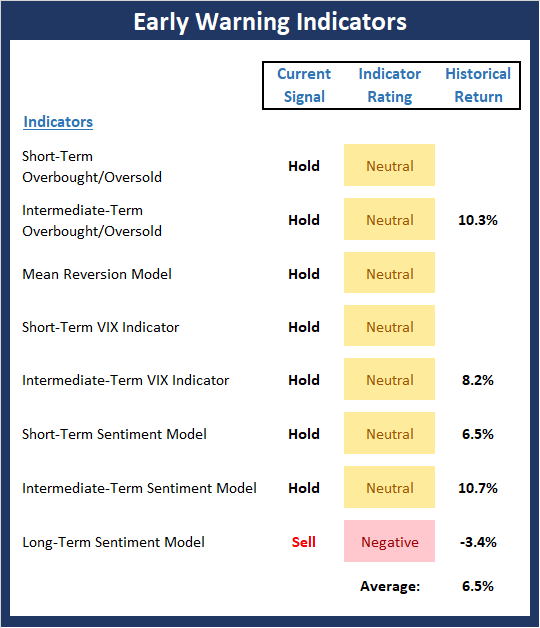 The "Early Warning" board provided a timely warning of the recent market weakness. However, those red warning flags are no longer flying, which suggests a more neutral environment. I.E. neither team has an "early warning" edge here. 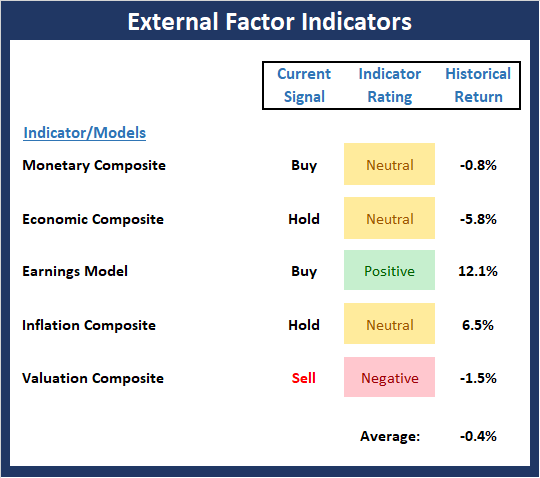 There were no changes this week to the External Factors board. The bottom line here is the board doesn't sport the bright shade of green one would expect to see with the market near all-time highs. At the very least, this should be viewed as a sign that we are late in the game for the current cyclical move. The latest upgrade to the Daily Decision service went live on Monday, July 9. The new, state-of-the-art portfolio is a multi-methodology, multi-strategy, and multi-time-frame approach that is comprised of three parts. At the time of publication, the editors hold long positions in the following securities mentioned: SPY, IJR, QQQ, XLK, XLY, XLV, AAPL, MSFT, AMZN, CNC, ICUI, TRU, VFC, DECK - Note that positions may change at any time.